Mindfulness is a way of learning to pay attention and relating directly to whatever is happening in our life and our daily experience. It helps us build resources to consciously and systematically work with our own stress, pain, illness, or other challenges that are part of everyday living. Everyone can benefit from being more mindful. Mindfulness courses help you establish your own mindfulness practice. They use combinations of exercises and practices based on meditation, body awareness, movement, personal reflection, home practice, and class discussion. Programmes are designed as a mental training, while enabling you to apply what you have learned in everyday life, and become more centred and discerning around situations and events that can be challenging. The classes are supported with learning materials, including CDs and course guides, to keep you on track. 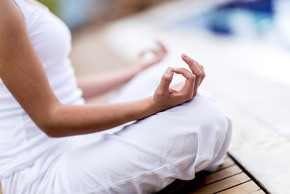 Mindfulness training is now recommended for stress and low mood by the National Institute for Clinical Excellence (NICE) and the Mental Health Foundation’s ‘Be Mindful’ initiative (www.bemindful.co.uk). It is beginning to be taught in schools, and has many more applications – in the workplace, in sport, in cases of chronic illness, among offenders, to name a few. Mindfulness Basics: At Equilibrium, we offer short introductory courses, so you can come and experiment a bit and see if Mindfulness is for you. This is a taster course, but it will get you started with simple, short practices. Look for the Mindfulness Basics course in the class scheduler – workshops and courses. Use the contact details below to contact the teacher if you have any queries. 8-week Course in Mindfulness Based Stress Reduction: We offering the full 8-week course in Mindfulness Based Stress Reduction. This is the ‘classic’ Mindfulness course. You don’t necessarily need to have done a Basics course before you sign up for this course. At present it is available in Peterborough every term. We plan to offer the course in Huntingdon in due course. Look for Mindfulness 8-week course in the class scheduler. Please use the contact information below if you are interested in this. Classes are taught by Barbara Reid. Barbara trained as a teacher of Mindfulness at the University of Bangor, and has worked with other Mindfulness teachers, including John Kabat-Zinn, the originator of Mindfulness Based Stress Reduction training programmes. She has taught adults for many years, and practiced Mindfulness herself since the mid 1990s. She also supervises new Mindfulness teachers for the University of Bangor.